In honor of Bastille Day, I am making something inspired by a French classic. For this recipe, I combined my two favorite treats – ice-cream and crème brûlée. I love crème brûlée, and it’s a dessert that I can now make perfectly every time in my SousVide Supreme. We have a great tried and tested recipe on our site, and it’s a perfect dessert to try with the SousVide Supreme. Most of the really delicious artisan ice-creams you get are made with a real custard base that includes cream, whole milk, sugar, and eggs yolks. One of the greatest advantages of the SousVide Supreme is that I can now make flawless custards without any hassle or stress. Custards used to be my cooking nemesis. Cooking custard on a stove-top cooker requires a lot of patience and skill. If I get distracted for even a minute, I usually end up with curdled custard, which is so frustrating and such a waste of expensive ingredients. It’s no wonder people avoid making home-made custard. 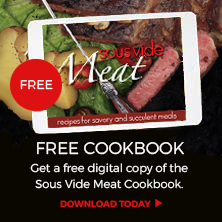 The beauty of the SousVide Supreme is that it is a really well-insulated device, so you can stay cool and fresh when making it, instead of slaving over a hot stove. Custard making no longer requires endless stirring, hoping and praying! I simply pop the mix into a zip-closure cooking pouch, remove the air and cook in the water bath. The SousVide Supreme has really changed things for the better, and I am now making custards a whole lot more. 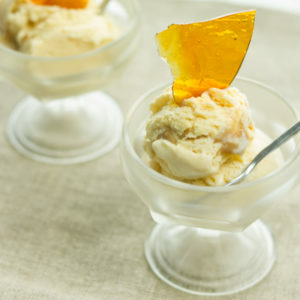 This ice-cream base is creamy vanilla custard with some dulce de leche for that subtle caramel flavor. Dulce de leche is something that can be easily made in the SousVide Supreme. I usually make a couple of jars at a time, as I always seem to find a use for dulce de leche! The caramel ice-cream is then churned and mixed with a few more swirls of dulce de leche before being frozen. To serve this decadent ice-cream, I garnish it with some sugar brûlée shards. These shards give the dessert, that satisfying crème brûlée crunch. This is an indulgent and delicious dessert that is worthy of any summer celebration. Place the milk, sugar, eggs and vanilla into a food processor and blend for a few minutes, just until well combined. You want to mix the custard, but not over whip it. Next add the cream and pulse to combine. Divide the custard mixture between two (quart /0.95 liter) zip-closure cooking pouches. I find it is better to divide the custard into two pouches, as it is a large amount of liquid and cooks better in two bags. Use the displacement method (Archimedes’ principle) to remove the air and zip the seal closed. Once the bag is zipped closed, submerge the pouches in the preheated water bath and cook for 1 hour. Set the timer if you’d like. Once the hour is up, take the custard from the water bath and quick chill the pouches in a sink/ basin of ice water. Allow to chill for an hour, before transferring them to the fridge. Leave the custard to cool for 8 hours in the fridge. While the custard is cooling you can prepare the sugar brûlée. Place half of the sugar into a frying pan over a low heat. As soon as it starts to color and caramelize, add the rest of the sugar. (I add the sugar in two batches, as it prevents the sugar from burning too quickly.) Once all the sugar is golden and caramelized, pour the hot molten sugar syrup onto a sheet of tin foil / parchment paper. Try to pour the syrup in a thin even layer if possible. Leave aside to cool completely. Once the brûlée sugar syrup has fully cooled and hardened, break it into large shards using your fingers. Once the custard is cool, pour it into a food processor together with 1 tablespoon of the dulce de leche. Mix for a few seconds in the food processor, just until the dulce de leche is combined with the custard. Then, pour the custard into an ice-cream maker and churn the custard according to your ice-cream maker’s manufactures instructions. 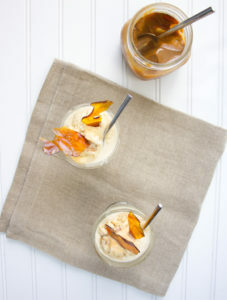 Once the ice-cream has been churned, spoon 2 tablespoons of the dulce de leche into the ice-cream and gently mix it through to create swirls of caramel. Finally, transfer the ice-cream to a Tupperware dish with a lid, and place in the freezer for at least 2 hours. To serve, scoop the ice-cream into dishes and garnish with the sugar brûlée shards.